The Main Street Electrical Parade is continuing its nostalgia run through most of the summer, and I figured this would be a good time to post another photo from the parade. Out of all the subjects to see, Pete's Dragon is probably the most iconic and popular. This lovable classic warbles his way through the parade route, while Pete translates to the crowd and greets everyone with cheer. We associate the parade with Main Street, but of course, it does have to come all the way from the back of Fantasyland. This means it passes by backdrops that form interesting juxtapositions, such as this Tomorrowland scene. 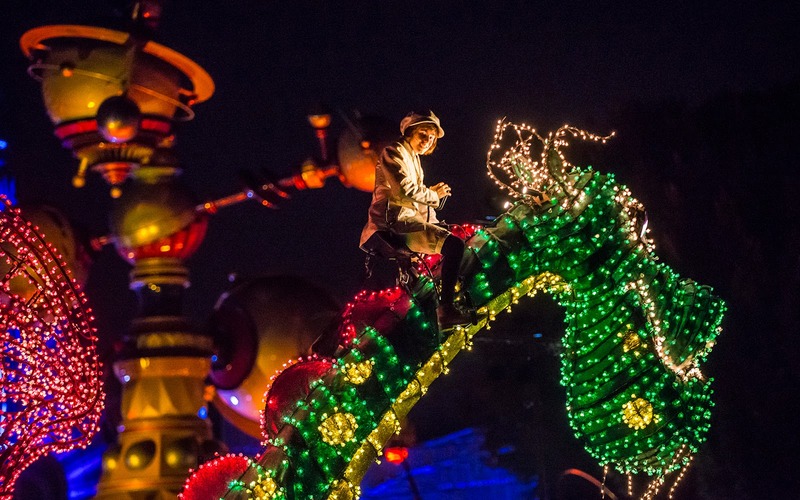 Pete rides his luminous dragon past the Astro Orbiter during the Main Street Electrical Parade.